Pressroom is a modern “legibility face,” designed to be easy-to-read under even the harshest conditions. 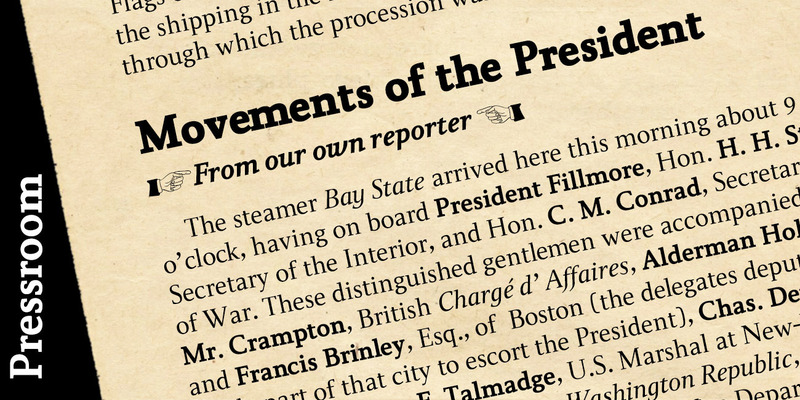 As you might expect of such a typeface, it’s got an ample x-height, robust serifs, and minimalist descendersbut Pressroom displays more grace and allure than most families of this kind. (Still, despite its relative beauty, its designer describes Pressroom as having “the sophistication of a crocodile.”) Pressroom has regular, italic, bold, and bold italic stylesalong with a special black weight intended for headlines, callouts, and other display uses. Numerals are semi-cap in all but the black, where they are fully lining. Would work well in newsletters, flyers, office forms, or even periodicals. US$99.